SKU: Dart 32AU20 Fusion 32 oz. 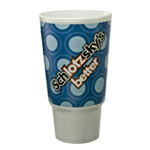 Foam Hot Cup - For Customization Only - 400/Case. Categories: DART, FOAM CUPS / LIDS, FOAM CUPS / LIDS-1.